A first-time Section A pass for "Boomer" with his young handlers. These photographs are from the Southern Newfoundland Club's Facebook page - you do not need a Facebook account to view them. Post by Southern Newfoundland Club. 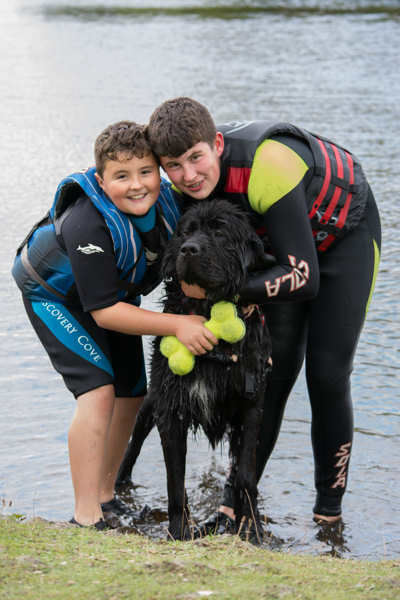 Clarke's Chateaunewf Meet Joe Black "Odin"
King's Safeharbour Dirty Dancing "Summer"
Webb's Ourfairview Dare To Bare "Mya"
"I would like to thank the Southen Newfoundland Club for asking me to judge for the first time at Bryn Bach Park and to Pete Lewin who was the senior judge with me. It was a lovely afternoon, sunny and warm. We had 15 dogs entered from which only one failed. It was exceptional to see one of the dogs who had only been in the water once before with his two junior handlers pass. A huge thank you to WNAG and to all those who helped steward." "Dave Thornton was doing his first water test and did a very good job. We had numerous dogs in Section A and all but one made the grade. Some who had their first attempt and all nervous and worried for no apparent reason. It's all about the fun and working with your wonderful dogs as a team. Well done all and thanks for the coffee, cakes etc.. Well done WNAG for a great event." Thorton's Applebanks Lucky Star "Moby"
Whitting's Darkpeak A Touch Of Frost "Rosa"
King's Safeharbour The Never Never "Sasha"
Arnold's Newgraden Knight Templar of Newfarrier "Arthur"
"The weather wasn't quite as kind to us this time. Glorious on the Saturday but not on the Sunday. However, this made no difference to everyone enjoying themselves. The standard of the Section C was again very high indeed with some excellent passes. The ones that didn't quite make it were very close and are more than capable of passing on another occasion. Thanks to Paul Dodd for being my co judge again. Big thank you to all at WNAG for again putting on a superb test event. Here's to next years tests." "Back again at picturesque Bryn Bach for Section C tests on the Saturday with co-judge Karen Thompson, always an enjoyable venue with lots of friendly, keen and able dogs and handlers. 10 entrants achieved six passes and those that weren't quite ready on the day will I am sure progress and pass in future. Lots of super-fast exists from the boat in the C1 exercise and a couple with very impressive leaps. In C2 some dogs were reluctant to go out to the 'drowning' strangers, that role being played by Sarah Buckle or Rhiannon Burridge each doing a great job, thank you. Handlers need to try to avoid dropping marks unnecessarily in this exercise - if the dog turns back that is one point deducted but physically redirecting the dog in the process of sending them out again costs another point. There are only seven points to play with, an eighth point deducted means a failure, so try and use voice commands and hand signals wherever possible rather than physical redirection. The C3 retrieve of a dropped object exercise was no problem for the majority but the same comment about dropping marks as in the C2 exercise apply. The C4 Controlled Swim exercise was done using the 'n' shaped route and we were treated to some excellent demonstrations of calmness and control from the handlers and attentiveness from the dogs. Thanks to the SNC for inviting me to judge and to Ann Thornton, the Test Manager, for a well organised test. Our hosts, the Welsh Newfoundland Activity Group were as hospitable as ever and their stewarding was excellent, thank you all." Trueman's Coltrana Trumans Shadow "Rufus"
"As normal, great hospitality. Loads of food and drink. Martin Magorrian, my co-judge, and I had three dogs in section E. Although two dogs tried hard, unfortunately they didn't make the grade on this occasion - but one dog and handler excelled on the day, well done. Big thanks to the test manager and all the group for their support." "First of all I would like to thank the Southern Newfound Club for inviting me to judge my first B test at Bryn Bach and to my fellow judge Paul Dodd. To the test manager and all the stewards, your hospitality is first class and makes it a pleasure to judge at this venue. The weather was very unkind on the day with the wind and rain, it made the tests harder to pass but all the entrants put in a huge amount of effort on the day. We had nine entries and three passes, with the rest only failing on one element. Looking forward to be invited to judge again." It was a pleasure to have Chris Roberts from my home working group judging with me today, his first time doing Section B and I think he enjoyed it. Typically it is usually a much lower percentage that pass Section B than pass Section A and that was indeed the case today with nine entrants but only three passes. It is tough having to tell entrants they haven't quite reached the standard but everyone accepted our decisions graciously, thank you. The first three exercises were no problem for most of the teams, it was the B4 underwater retrieve which as ever proved the biggest challenge for some. The rocky lake floor and patches where the sediment had been stirred up reducing visibility made it more difficult but those that were successful coped with that and those dogs who failed this element had little or no interest in the sinker object despite the best efforts of their handlers to engage them. The B5 exercise saw a mixed bag of results, some excellent controlled swims being demonstrated and some needing more work to reach the standard. I complemented the owner of the dog who did the best of the controlled swims we saw and the reply was "She loves this exercise". 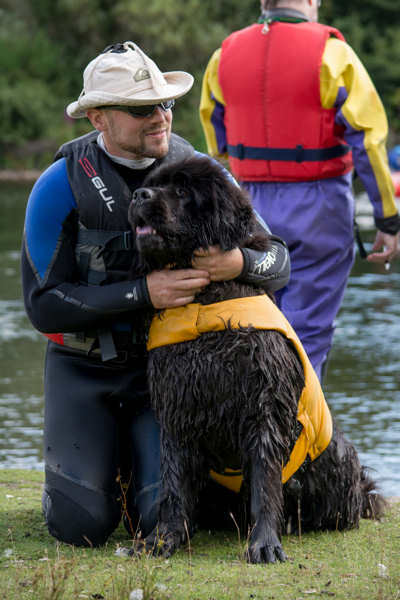 That sums it up really, the dog needs to ENJOY the experience of swimming with the handler to excel at this exercise. My thanks to all of the members of the Welsh Newfoundland Activity Group who hosted the event and did a great job as always making everyone welcome."